Some friends of mine found themsleves the proud caretakers of a very precious kitten. 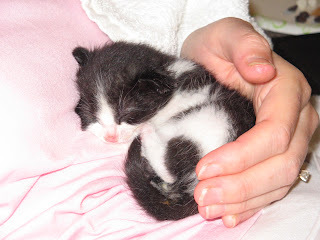 This two week old kitten had been found in a nearby ditch by some neighbor kids. The kids brought the kitten to these friends in hopes that they would nurse it to health. Apparantly, someone had tried to drown a litter of kittens and this one managed to survive. Last night they brought this cute little kitten with them to a social gathering at our house. It had to be fed every two hours and couldn't be left at home. For me, this was a little taste of heaven. I LOVE cats and more particularly kittens. My attraction to kittens goes way back. My mom recorded, in a 'baby book' that my first word was not 'mommy' or 'dadda' but kitty'. My first sentence was "Where's the kitty?" The guy I married is allergic to the creatures and so I have not been able to own one of my own since. So, when these friends asked if they could bring the kitten over, I was elated. Unfortunately, I had to share this kitten with nearly every other adult in that room. Ah well, nothing's perfect. Some folks are cat people and others are....wellll.....not cat people. I would not mind a cat if it was an outdoor cat, but I have had it with cats in the house. I think that even if you were to give a chimpanzee a chainsaw it would not wreak more long-term damage to a house. I have a very soft spot for animals, though, so when my 'new' daughter brought home a kitten, I could not say no, but I was not terribly happy about it. I had just gotten my son's cat operated on and had 'trained' (if that is really possible) the thing to not utterly destroy my habitat, when another one shows up. Just like some people are dog people and some are not dog people. There are very few dogs I have liked. My parents always trained their cats to use the outdoors for their sandbox. But, yes, they can sometimes wreak havoc on things. You always have to have a post for them to scratch their paws on. We had a cat when I was a teenager who, like most cats, liked to chase and bat at things that dangled. Well, one day this cat (Snoopy) was batting at a cord that hung down from some roll up blinds. She would get the blinds to pull down and then as she let go of the pull string they would wind back up. One time she pulled a little too hard and as the blinds rolled back up they got knocked out of the window. At this juncture Snoopy pounced on the rolled up blind and tore it to shreds. From then on whenever she found anything that resembled those blinds, like paper towels, she would attack it with the same vengeance.